Everybody loves a great sandwich. Make your own masterpiece. Sandwich recipes were a popular topic in my clinic's training kitchen. Clients would gather around as each prepared and shared their favorites. I learned a lot. Popular sandwiches are highly regional, like Chicago's Italian Beef Sandwich or New York's famous pastrami or California's veggie-laden low calorie sandwiches. All good and each one a delight. Then there are the all American classics. Subs, cheeseburger recipes, chicken salad, hot dogs and the wide array of sloppy joe recipes. A healthy lunch idea could start with a light egg salad sandwich. A great dinner idea could build around a big and filling Italian Beef Sandwich. Or meatball sub. 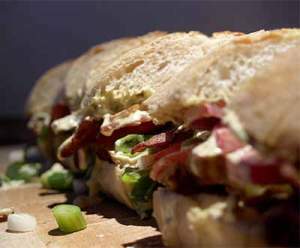 The sandwiches featured on Sandwich Solutions offer you a great variety of quality sandwiches that should cover every situation. Hot or cold. Big or little. Heavy or light. For lunch or dinner. Regional favorites to American classics. Delicious recipes for every occasion. With a distinct emphasis on fast, good and simple.